The Soekarno-Hatta International Airport Skytrain was officially launched on September 17. The launching event was attended by minister of state-owned businesses Rini Soemarno, transportation minister Budi Karya Sumadi and Angkasa Pura II president director Muhammad Awaluddin. “I’m very proud that the project is completed in 12 months, this is due to the good working synergy between BUMN (State-owned businesses) and transportation ministries,” said Rini. “Angkasa Pura II has given an extraordinary contribution to the people through this Skytrain,” added Budi. Moreover, the launching date also coincided with transportation ministry’s Hari Bhakti. Budi said that Skytrain will increase the number of overseas tourists visiting Indonesia via Soekarno-Hatta International Airport. 30 percent of the total of international tourists in Indonesia arrive at Soekarno-Hatta International Airport, 40 percent arrive at Ngurah Rai International Airport in Bali and 20 percent arrive in Batam or Bintan by sea. The launching of the Skytrain followed the tourism minister's regulation No. KO 841, year 2017 on Special Train Operational Permit for PT Angkasa Pura II (Persero). The Skytrain currently serves passengers who wish to travel from Terminal 3 to Terminal 2, and vice versa, with the operational hours from 07:00 a.m. – 09:00 a.m., 12:00 p.m. – 02:00 p.m. and 05:00 p.m. – 07:00 p.m.
Two trains that can accommodate up to 176 passengers are available on the 1,700 meter-long track. The Skytrain service is free of charge. 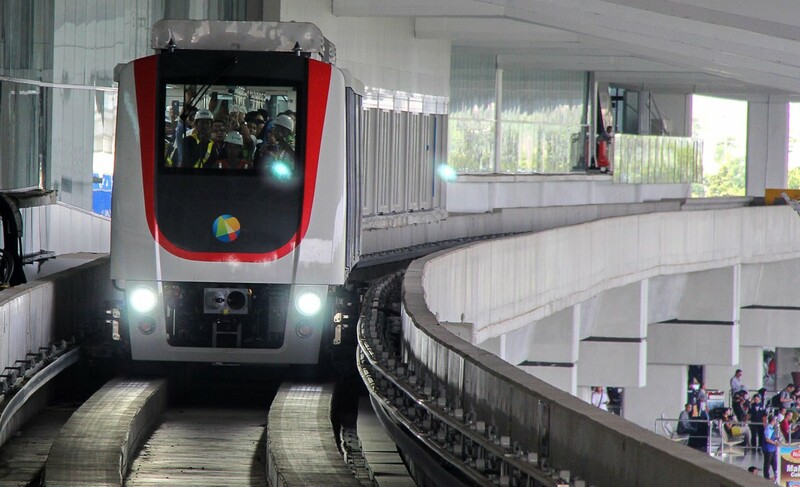 Although the Skytrain is the first unmanned mode of transportation in Indonesia that uses automated guideway transit system, in its first six months of operation, a set of crew will be operating the vehicle.